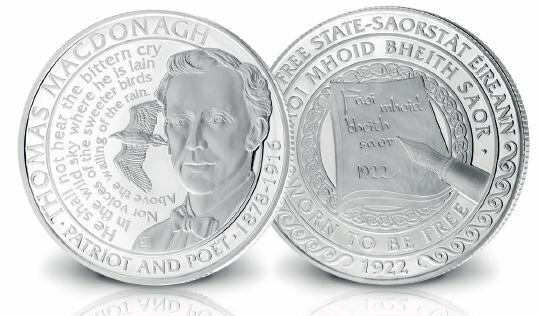 The Thomas Macdonagh silver plated medal is part of the seven signatories set which includes seven portraits of Irish Heroes. Each medal depicts the portrait of one of the Seven Signatories, together with their name and a fitting individual inscription. The commemoratives all share a common reverse design inspired by ‘Amhran na bhFiann’ (‘A Soldiers Song’), which was first coined during the Easter Rising and then adopted as the national anthem of the Irish Free State in 1926. During the Easter Rising, Thomas MacDonagh led the rebel garrison at Jacob's Biscuit Factory. The commemorative features a portrait of MacDonagh with the poem 'Lament for Thomas MacDonagh', by his friend and fellow nationalist Francis Ledwidge, written in 1917. It also features the inscription 'Patriot and Poet' as he was a gifted poet, writer and dramatist, and key member of the Irish State.